This news got lost amidst the deluge of the earthquake and tsunami, but I wanted to mention that the great comedian and actor Sakagami Jiro passed away on March 10, 2011, the day before the disaster. He died of a cerebral infarction at the age of 76. Like Kitano Takeshi after him, Sakagami trained as a comedian on the stages of Asakusa, working in between strip shows. It was there that he met Hagimoto Kin'ichi and the two formed Konto 55-go, a duo that specialized not in manzai talks, but skit comedy (called "konto" in Japanese, from the French "conte"). From the late 1960s to the mid-1970s, they ruled the small screen and even had their own film series. The skits were the center of their TV comedy, but their "yakyuken," in which guests would do janken (rock-scissors-paper) with Sakagami, with the loser forced to take off a piece of clothing, earned the wrath of the PTA, but also helped transform variety programming into the game-filled, participatory space of "friends" that it is today (as I talk about in my article about telop/subtitles). Hagimoto (known affectionately as Kin-chan) went on to become the king of TV in the late 70s and 80s, but whereas his was always a clean TV, Jiro always had a touch of the strip halls in his comedy. 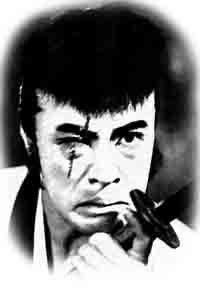 Sakagami appeared in many films, but foreign viewers might remember him as the old, doddering Inoue Genzaburo in Oshima Nagisa's Taboo (Gohatto). Oshima's aim in the casting was to have the Shinsengumi, who in reality were mostly in their 20s and early 30s, played by actors in their 50s and 60s, with Sakagami being the oldest. This not only emphasized through contrast the two young lovers, but really transformed the drama within the Shinsengumi into a generational conflict, one not unrelated to that of the postwar Japanese left. It was a stroke of genius and Sakagami made it work. Sakagami was famous in part for the gag phrase "fly away, fly away!" (tobimasu, tobimasu). So we can say now, "Fly away Jiro." Here's a short konto from one of their old shows. Jiro is the flustered waiter and Kin-chan the sly customer.